Dubai: His Highness Shaikh Mohammad Bin Rashid Al Maktoum, Vice-President and Prime Minister of the UAE and Ruler of Dubai, announced the Ghaf tree as the theme for the Year of Tolerance 2019. On his official Twitter account, Shaikh Mohammad said: “Tolerance is a universal value… and the Ghaf, our national tree, is the source of life and stability in the middle of the desert. Under its shadow, our ancestors gathered to discuss their daily lives. Ghaf trees are a hardy species and survive harsh, arid conditions in the dunes by sinking roots extremely deep into the earth to reach water aquifers ordinary plants can’t source. What is a ghaf tree? Prosopis cineraria, known as ghaf, jammi, shami or khejri, is a flowering tree from the pea family fabaceae. It is a drought-tolerant evergreen found in the desert that requires very little water to survive. Only one in 5,000 seeds actually take root as insects eat them, but once one takes hold its deep root system, which delves to beyond 30 metres, binds the soil together helping to combat desertification, keeping vital desert ecosystems in tact. Why is it so important to Emirati culture? 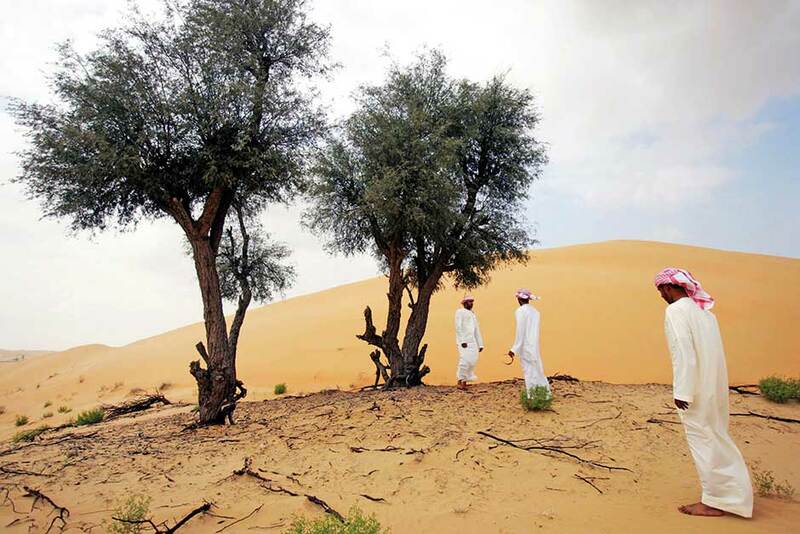 In 2008, it was declared the national tree of the UAE not only for its sustainability through low water consumption and its ability to maintain desert ecosystems, but also for its many cultural uses. During food shortages its pea-like pods provided nourishment, and even its bark was ground to make flour. As well as food it also acted as fuel, and provided resin, dye and medicine with its bark healing rheumatism, and bites from scorpions and snakes. To top it all it also provided shelter and a place to meet and hold tribal meetings underneath its branches. As a vital source of life it brought the community together and sustained them in many ways. The Supreme National Committee of the ‘Year of Tolerance’, chaired by Shaikh Abdullah Bin Zayed Al Nahyan, Minister of Foreign Affairs and International Cooperation, said the ghaf tree was chosen as a major component of the logo due to its great significance as one of the authentic national trees in the country. “The late Shaikh Zayed Bin Sultan Al Nahyan has given great importance to the ghaf and issued laws and regulations prohibiting the cutting of the tree throughout the country,” a statement by the committee read. The committee of the ‘Year of Tolerance’ concluded by saying it is working to establish policies and legislations that guarantee the sustainability of tolerance as a community value and a platform for good work in the UAE, inspired by the legacy of Shaikh Zayed Bin Sultan Al Nahyan, who established the country’s foundations based on the values of tolerance and positivity. The Ghaf tree is of historical importance because it was used in traditional medicine, its fruit and leaves were used as food for people and their cattle, and it also increases the oxygen level and helps reduce dust in the desert. The Ghaf flower can be used to prevent miscarriages, while its residue extract from the stem contains anti-inflammatory properties. The bark of the tree was also traditionally used to treat bronchitis, asthma, leukoderma and muscle tremors.